EN. Summer 1993 (Original title: Estiu 1993) is a 2017 Catalan-language drama film directed by Carla Simón. The film premiered in the Generation section at the 67th Berlin International Film Festival, where it won the GWFF Best First Feature Award. It was selected as the Spanish entry for the Best Foreign Language Film at the 90th Academy Awards, but it was not nominated. In the Summer of 1993, Frida, a six-year-old little girl, leaves Barcelona and her grandparents for the countryside. After her father, her mother has just died of a mysterious illness. Taken in by her uncle Esteve and aunt Marga, Frida discovers her new environment, an old stone farmhouse in a mountainous area close to a dense forest. Her new "parents" prove friendly. Another good point is that they have a three-year old daughter named Anna who can become a playmate. For another child less disturbed than miserable uprooted Frida, this would be the most idyllic of stays, in other words a permanent vacation. But Frida IS disturbed and if there are undeniably good times at her new "home", there is also the unexpressed pain which makes her both feel sad and behave badly. Will Frida overcome her troubles? Only the end of Summer will tell. ES. Frida (Laia Artigas), una niña de seis años, afronta el primer verano de su vida con su nueva familia adoptiva tras la muerte de su madre. Lejos de su entorno cercano, en pleno campo, la niña deberá adaptarse a su nueva vida. 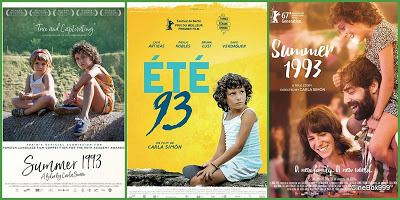 Cast: Laia Artigas, Paula Robles, Bruna Cusí, David Verdaguer, Fermí Reixach, Montse Sanz, Isabel Rocatti, Berta Pipó, Etna Campillo, Paula Blanco, Quimet Pla, Josep Torrent, Noemí Piñana, Ricard Catalina, Jordi Figueras. Download Estiu 1993 / Verano 1993 / Summer 1993.